Crafting for all Seasons is having another challenge! Our theme this challenge is Birthday! 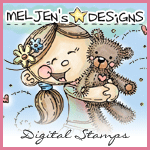 Come on over to the blog and check out all the winning entries from the Bingo challenge! There were so many incredible projects we could not stop at just three winners! Thank you everyone for your wonderful entries last challenge. We can't wait to see what everyone makes for this new challenge. We would love to see layouts, altered projects, cards, and other fun ideas. Keep them coming! The prize for this challenge is 4 digital images! Since bees are black and yellow, I wanted to try and stay with those two colors in making this card. 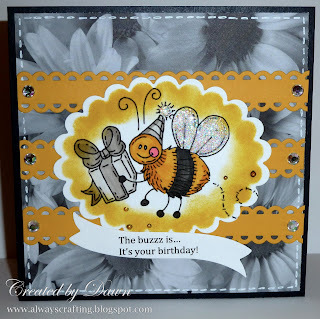 Bee-utiful card, Dawn!! Love the fun image and great design. The touch of sparkle is perfect. Fantastic card Dawn, just love the colours! This is a pretty card Dawn, I love the sparkling wings and the sentiment.